Just through the Carlisle rotary, down the way from the main farm, sits our Farm Market, circa 2015. 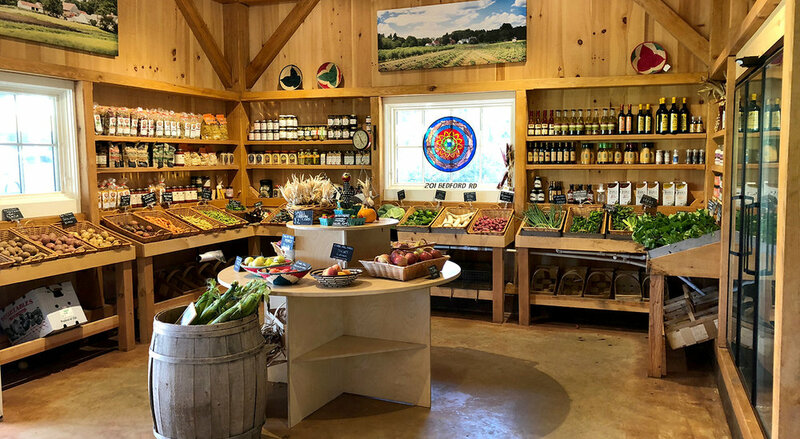 Our extraordinary post-and-beam farm market located at 201 Bedford Road is nestled in between some of our ORGANIC crop production fields & a large Pick-Your-Own (PYO) garden. PYO strawberries, cherry tomatoes, beans, flowers & herbs are seasonally available, while our own USDA certified organic produce, pasture-raised eggs, meat, & locally grown fruit are available in-market. We also source interesting dry goods & snacks, local milk, cheeses & meats from like-minded people who we admire. New this season you will find merchandise created by local artisans as well as exciting new Clark Farm merchandise! Relax & enjoy fresh-brewed, direct-trade coffee & freshly baked pastries in the outdoor cafe while looking out onto our bucolic fields. Local first. Thoughtfully sourced, always. Sign up with your email address to receive Clark Farm Market news and updates. Thank you, now Lettuce Turnip the Beet. Our hope for Clark Farm Market is to share our core values with a greater number of our community.